Many of the essays and monographs that Mises wrote between 1940 and 1944. 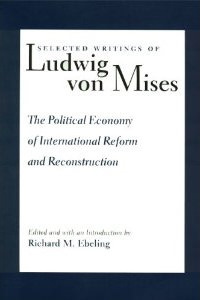 During his first years in the United States, Mises devoted a significant portion of his time to analyzing the nature and causes of the political and ideological trends that had brought the Europe of the 1920s and 1930s to the abyss of war and destruction. He also attempted to outline a set of policies through which a post-war Europe could recover from the consequences of conflict and collectivism. Many of the essays and monographs that Mises wrote between 1940 and 1944 on these themes have remained unpublished until now. In 254 pages, Mises presents and articulates the political economic agenda for a post-collectivist world, a world of individual freedom, international peace and global prosperity. Though written in the 1940s, Ludwig von Mises' essays offer the true agenda for the society of tomorrow, the free society of the 21st century.